Do you ever feel like a small music fish drowning in a big music pond? Ever feel like you're at a disadvantage because you don't have the money and backing of a big corporate entity behind you? Wanna know the reason you feel that way? It's because you have chosen to define yourself by those terms. If you want to feel more empowered, it's simply a matter of making better choices about the way you define yourself. Here's another way to look at your situation as an independent artist in the modern world. You have an advantage as a hands-on artist that record labels and major acts don't have: the ability to communicate on a more personal level with your fans. Genuine is an e-mail from a person rather than a company. If the lead singer of some band that I like sends out an e-mail to those of us who have registered our interest, that's authentic in a way that a record label sending out an e-mail wouldn't be. If the lead singer responds to his e-mail, that's even better. A MySpace page is more authentic than a billboard. A blog is more authentic than a press release. It's all about having a human voice and re-personalizing the connections. As an indie artist, you live in an incredible era. It's never been easier to personally interact with people around the world. And as a musician who has only hundreds or maybe thousands of fans, you are able to communicate with them in a much more personal way than an act that has millions of fans. That's not to say you won't some day have millions of followers. But in the meantime, don't beat yourself up for not being at a "higher level" in your career -- whatever that means. For now, embrace and be grateful for your independence and current status. It is allowing you to build meaningful relationships with fans -- the kind of bonds that will last a lifetime and lead to a stronger, more satisfying music career in the long run. 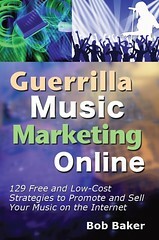 Want to create a music buzz online? Check out my special report 50 Ways to Promote and Sell Your Music on the Internet. We independent musicians can always use a boost once in a while! As a friend of mine says: "When you change the way you look at things, the things you look at change." Thanks, Bob, for another great article.